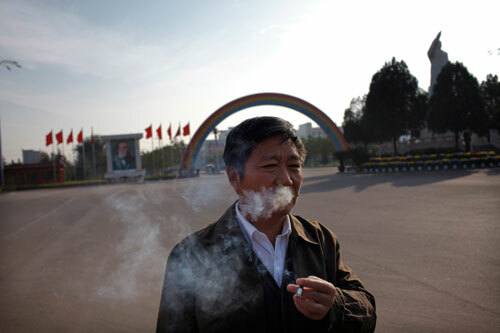 Communist Party Secretary, Wang Hongbin, stands in "The East is Red" square (Dongfanghong square) of Nanjie village in Henan province, China on 3 November 2009. To the left of Mr. Wang is a picture of Friedrich Engels, and on the right is a three-story high white jade state of Chairman Mao Zedong. Portraits of Marx, Lenin and Stalin decorate other sides of the square. The Chinese economy was liberalized and reformed in the decades after the Great Leap Forward, when forced collectivization brought on famine and economic catastrophe. Going against the privatization trend of the rest of the country, Nanjie village started to re-collectivize its land in 1984 under the leadership of Wang Hongbin. Today residents of the communist village live in identical apartments and are given free health care and education, but receive only a token salary, paid in coupons rather than currency.